Most of what's below is related to food & drink. I'd also recommend wandering down Magazine Street and ducking into any & all shops, galleries, pubs, & shops that strike your fancy. I hope you have a great time. Let me know if you hit any of these places. I should probably formalize the list a little better, but it serves its purpose for now. Who knows, maybe I'll come back and edit this post. If you have ANY questions about these places, other places, other ideas, ANYTHING, please let me know! Also, if you have suggestions or recommendations, feel free to add them in the comments. Some of these are definitely splurge options, some are less so. If you're looking for something in the French Quarter, places that come to mind are Muriel's, Stella, Broussard's, Galatoire's, Antoine's (but not Pere Antoine's). If you're willing to go just a few blocks away, on the uptown side of Canal Street, I might recommend August for a good splurge venue. It's one of John Besh's restaurants. He is an adored figure in the contemporary culinary scene. It's high end, and a real treat. One of my friends goes there every year for her birthday. I've only been once. And loved it. You don't like seafood? No problem. 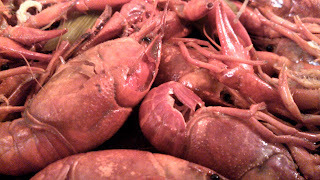 We eat EVERYTHING in the Crescent City :-p Try jambalaya. It's normally with rice & chicken. Try red beans & rice. It's usually with smoked sausage. There's also gumbo made with duck (or chicken or turkey) and sausage. No seafood. That's actually the kind I make most often. We're not really known for our barbecue, exactly. I mean, we have OK barbecue, but there are other parts of the south that are known for BBQ. We do eat a lot of meat, but I wouldn't necessarily say BBQ is a forté of the Big Easy. I'd totally recommend a roast beef or debris po-boy while y'all are there. If he's not averse to lettuce, tomatoes, pickles, and mayo, I'd highly recommend ordering a roast beef po-boy "dressed". Gravy & meat on soft french bread. mmm.... I think I might need to get one when I'm there next (duh!). Those you can get anywhere that has po-boys, pretty much. In other words, I'd try whatever meat dishes, sandwiches, preparations are available at places y'all go without looking explicitly for BBQ. There's a place I like called Cochon, in the Warehouse district, very close to the National World War II Museum (a fantastic museum!). It was listed by the local newspaper as one of the top 10 N.O. restaurants in 2011 (or 2012). It's owned by Donald Link, an awesome local restauranteur who works magic with pig. You could also just go around the corner (literally, about 60 ft away from the front door, there's effectively a side door that takes you in) to Butcher, also owned by Donald Link. They've got sandwiches & such. Worth a visit if you're in the Warehouse district and want something smaller. I went there just to get sausages to bring back to Seattle. I usually stock up when I go home and keep sausage from Louisiana in the freezer here. I'd also recommend a muffaletta (pronounced along the lines of /muh fuh LAH tuh/) from Central Grocery on Decatur. Two people can split a half and you'll have plenty of food. Or, if you can get a quarter, get a quarter & keep eating your way through the day. If you happen to go one day to Magazine Street, there's a place called The Rum House that has good food & good service. There's another neighborhood restaurant called Joey K's that's a neighborhood homey restaurant that'd be good for a lunch break. Speaking of neighborhood color, there's Katie's Restaurant & Bar in Mid City. You mentioned Frenchman Street, I believe (or maybe I did). There's lots of music & bars & restaurants on Frenchman. If you're walking back to your hotel from there at night, do us all a favor and walk on a street with bright street lights. If you're looking for food on Frenchman, you might want to check out The Praline Connection. My brother seems to go there whenever he comes in town, especially when he visits his friends that live in Faubourg Marigny. It's soul food, creole, cajun, and delicious. (Esplanade Ave, just on the edge of the French Quarter): drink to order: Monsoon (rummy & tropical, IMHO, better than a hurricane from Pat O' Brien's -- but you should go there too!, which is too syrupy and medicinal). Great big BURGERS & baked potatoes. Get a burger. Seriously. Medium Rare. Go for bacon & cheese and/or sauteed mushrooms. Load up the baked potato. Split it with someone you love. Either in Fat City in Metairie (the original location) or at the Hilton downtown (newer. never been to the downtown one, but owned by the same local family). Charbroiled oysters there are amazing!!! It's a really good food off the beaten path (the Metairie restaurant). Named after a town in Creole country, this Vacherie is on the corner of Toulouse & Dauphine. I haven't been there, but the menu looks pretty darn good. Who knows. This is your lagniappe entry. You really can't go wrong with any of these. They're listed in no particular order, but the last four are in a different category, as they're all in the French quarter and of a slightly different ilk. Some are a tad more old school New Orleans creole and, IMHO, may be resting on their laurels. Central Grocery 923 Decatur St, in the French Quarter. Go here and get a 1/2 muffaletta (pronounced muh-fuh-LAH-tuh). 1/2 is pretty big, fyi. It's an Italian grocery/deli. The muffaletta is a New Orleans traditional sandwich. Various sliced meats & cheeses, olive salad (think chunky tapenade mixed with other pickled veggies), oil & vinegar, on sesame seed bread that is hard to find anywhere else. Jacques-Imo's - LOVE IT. In the Uptown/Riverbend area. Crowded: getting a table can take a while. New Orleans fare like stuffed catfish (catfish sauteed & topped with a sort of crabmeat or crawfish dressing, redfish, mirliton (aka chayote squash in other parts of the US), crawfish, etc.) While you wait for a table, get a drink & walk across the street to the art gallery and check out some work from local artists. Patois - "classic french food with a local accent"
August - I have deep respect for Chef John Besh, who was born & raised in Southern Louisiana. A couple of friends of mine go here regularly. I would actually recommend checking out and going to any of his restaurants. I think August is probably the most upscale of any of them (as of this writing). Domenica, in The Roosevelt Hotel, is helmed by Chef Alon Shaya: really good, innovative Italian-inspired dishes. Cochon - Donald Link is a native Louisianian (like John Besh). He's got some phenomenal food there, rooted in the meaty traditions of South Louisiana. There's also a butcher shop/deli next door called Butcher that's got super sandwiches and such that are less expensive than but just as tasty as the fare at Cochon. Another delicious Donald Link restaurant is Herbsaint. Went there with my parents in October 2011 & had a wonderful dinner. Gautreau's - went there with my parents when I was home in November 2012. It was a bit pricey, rather elegant, and a very memorable experience. It's uptown and probably not very well known by people not from the city. Commander's Palace - During the week they have $0.25 martinis & cosmopolitans @ lunch time (yes, really). If you're feeling like a high end lunch, go here. Dinner is probably pretty expensive. Only been for lunch. Fat Hen Grocery - Got eggs creole last time I was there. Hearty, homey. There's a meaty, bbq smoke smell in there that drew me in. Really light & open. NOLA.com and especially or Best of New Orleans should have some news about what's going on. You'll also want to pick up a copy of Gambit weekly to see what's going on, what's hot, what's not. the largest number of locations; but if they see daiquiri anywhere on a sign, there will probably be at least a few flavors. Check out the bar at Arnaud's restaurant. There's a bartender there named Chris Hannah. He's awesome. The cocktails are wonderful, inventive, and powerful. Be fancy. And while you're there, take your drink and go peruse the collection in the small Mardi Gras museum upstairs. 214 Royal Street @ corner of Iberville inside the Hotel Moteleone, in the French Quarter: sit at the bar, it rotates ... slowly. The revolving Carousel Bar has been there since 1949. And you mentioned the candle-lit Lafitte's Blacksmith Shop. Yes. Simply Yes. If you're curious and adventurous and haven't had your fill of sugary & very potent alcoholic frozen beverages, order a frozen voodoo (Everclear & grape ... look out). You must at least stroll through Pat O'Brien's bar(s) at 718 St. Peter St., just a couple of blocks from where you're staying. Have a drink in the piano bar or sit on the patio...or both! 4133 S Carrollton Ave THURSDAY NIGHT is usually Zydeco Night. Rock N Bowl is always great fun: bar, dance floor, live music, bowling. who could ask for anything more. I liked the old location better, but that was before Katrina (alas!). Still a lot of fun. Check their calendar online. Cover is probably $10 at the door. Rock n Bowl is in mid city. If you go to Jacques Imo's in River Bend that night for dinner, for example, then you're pretty close to Mid City Lanes. Maple Leaf Bar is on Oak Street Uptown/Riverbend area. Live music just about every night. Rebirth Brass band plays there every Tuesday. They've got local music, funk, good stuff, in general... and it's close to Jacques-Imo's (see below). This is a fantastic option for something close to Jacques Imo's since it's just two doors down. Rebirth Brass Band plays there on Tuesday nights when they're in town. You can totally hear them from the street if you don't feel like going in. I don't know what time their set would start, but you could check them out for a bit before or (more likely) after dinner. It's traditional funk(y) brass band music from New Orleans. It's the kind of stuff that gets me movin'. Take the Canal St. Streetcar away from the river and go to a cemetery or two, or take it to the N.O. Museum of Art, possibly depending on what rotating exhibits might be there, or just to City Park. During the holidays there's a very nice light display in City Park. Little known but very interesting small Voodoo Museum at 724 Dumaine St. in the French Quarter. Talking with the proprietor is worth a visit. He's an interesting character himself! If you're interested in checking out an awesome local distillery one afternoon, call Old New Orleans Rum / Celebration Distillation (504-945-9400). They have a courtesy van that picks you up in the French Quarter if you like and can take you to the distillery & back to your hotel. I'm not sure if Mary does all of her tours or if she has people working for/with her. She's a voodoo priestess who led a workshop I attended at the Folk Magic Festival in New Orleans in 2012. Her walking tours are $27/person and the semi-private van tours are around $67/person. Haunted History Tours does a lot of volume and consequently has lower rates, it looks like. Their walking tours are $20. I'd be more inclined to go w/ Bloody Mary and get a unique and personal perspective. There's a chance they may end up being operated by the same company. I might just see if your hotel knows anything or can guide you, get you a deal/discount, or something. I unfortunately don't remember the company we used when we went. I do remember that we had a blast. We drove ourselves, which made the price lower. It may seem a bit pricey, but it's a unique experience and a really good time! Keep an eye open for a discount somewhere. Wow. This is a lot (more) to digest than I had originally anticipated. I realize I need to distill this better going forward -- but I'm just getting you as much as I can. Really, I'd love to be there myself to guide you on a customized, guaranteed-to-be-spectacular experience of the city myself. Hope this helps. Have fun in New Orleans! Just like [red] beans & rice. And that's why fall is nice. That may have been a second or third grade poem. Let's hope second. I've come a long way from whichever year that was - emotionally, spiritually, physically, and intellectually (whew). Speaking of coming a long way, recalling that lovely bit of verse I wrote at seven or eight years of age made me want to see if the grammar school I attended had a web presence. Sure enough: St. Benilde School is on line. Back in the day, I don't even know that we knew what "on line" (or "online"?!) might have meant. Gichi-ziibi (or misi-ziibi) continues to grow, crest, surge, and overflow its levees, inundating towns, homes, and people in the Mississippi Delta and southeastern Louisiana. Feeling nostalgic as I often do, especially in times of regional crisis, I decided to make red beans and rice this Monday. Sunday your family eats a ham. Monday is laundry / wash day. While you're slaving away doing the wash, beans simmer away without much fuss in a pot for a few hours, accompanied by hocks and other hunks of ham left over from the day before. ... a New Orleanian "set it and forget it" meal.